He thought he heard the policeman say, Ngunit — but — and then, “mga estudyante.” Epifanio did not want to listen anymore and turned away. He found a few of the men gathered by the front door, whispering urgently to one another. Epifanio forced himself to approach. As he took a step forward, and then another, he felt a slickness on his shoes. He looked down, and dully noted that something dark seemed to have smeared the soles of the sneakers that were practically brand new, bought from Gaisano Mall the day before he left Bacolod. He didn’t understand. His thoughts were slow. Perhaps that was Sheryn’s laugh he had heard, ringing in his head when he reached the urgently whispering men. Sheryn’s laugh was almost ear-splitting. The day was just beginning, but already he detested and feared it. “Gonzago here thinks he heard something,” said another man, the one Epifanio knew only as Baby. Epifanio had heard some of the men gossipping about Baby. It was strange: he had angered his in-laws by slapping his wife, and they had made it impossible for him to remain in his own home, constantly abusing Baby in front of his own children. Gonzago was old, almost forty. Everyone knew he roamed the halls in his sleep. “If I did hear something,” Gonzago said, “it wouldn’t have helped. I might have heard this man’s soul leaving his body, yes. It sounded like water slipping down a riverbank.” Gonzago gestured, his right arm driving cleanly through the air. Only then did Gonzago realize that the floor of the lobby was covered with the same dark substance that stained the soles of his sneakers. It was everywhere. There was even some of it smeared across one of the lobby’s light blue walls. The story hardly made a ripple. But it’s more important to self that it be read. So, she’s going to post it on this blog, in sections. Here’s section 1. The setting is Ermita, which is an older neighborhood of Manila. She wrote this story in one go, to meet a deadline. She’s expert at writing things in one go. That is why flash is her little playground. This story is a bit longer than her usual. Which parts of a bird are edible? He would guess. Yes, he could do that. Not the internal organs. Not the beak. Not the feathers. He wrote, laboriously: eyes, tail, breast. Afterward, when they were gathered in the small lobby, they were offered warm Coke in thick glasses, no ice. Why would anyone ask them a question about birds? They were there to study to be seamen: most of them were from Negros, like Epifanio. The rest were from Marinduque, Zambales, Cagayan de Oro, Davao. After two years on one of the inter-island ferries, and provided they received good evaluations, they might get the chance to work on one of the cruise ships that went to Hong Kong and Singapore. Epifanio clung to this hope. He liked the young woman who had been waiting to greet them the day they arrived in Manila, but there was no sign of her the next day, or the next. By the third day, he began to notice a fat man who sat in a little room on the first floor. The room had desks and filing cabinets, like a regular office. Epifanio learned later that the man’s name was Leandro. Epifanio pretended that the young woman had kindly shared with him a tube of toothpaste and he wanted to repay her. “Is she coming back?” he asked. The man smirked. “She’s sick. Morning sickness. What’s your name again?” Epifanio gave his name. The man gazed down at a sheet divided into two columns. “From Bacolod,” he said, and smirked again. “Silay,” Epifanio said. And he thought: I have been to college. I have had two years in San Agustin. And you — ! He lowered his gaze and shrugged and gave a self-deprecating smile. When Epifanio later replayed the conversation in his head, he hated the way Leandro seemed to know instinctively what Epifanio was after. And Leandro’s smirk would return again and again to his memory. The rules of being a seaman: The shared toilets must be cleaned and ready for inspection at five a.m. When a passenger requests assistance, the seaman must smile and show his willingness to be of service. Even the most unreasonable guest will appreciate a smile. Manila, this teeming city, pressed on him: dense, impenetrable. The sounds were many and various and ill-tempered. They abated only a little, towards dawn. His eyes were heavy from his dreams. Sheryn, I love you, he would dream himself saying aloud. In the dream she always laughed, as if she could hear him speaking, even across so many islands. I love you, I love you, I love you, he would say, his fists clutching the sides of the thin mattress. On the sixth day, there was no one in the little office. Papers were scattered on the floor. The filing cabinet drawers hung open. The desk had been overturned. A policeman stood by a window, speaking into a cell phone. Manila Noir was edited by Jessica Hagedorn and published by Akashic Books in 2013. “Desire” can be found in Part III (“They Live by Night”) of the anthology. The story’s setting is Ermita. What parts of a bird are edible? Epifanio did not know. He would guess: eyes, tail, breast. Afterward, when they were all gathered in the small lobby, they were offered warm Coke in thick glasses, no ice. Why would anyone ask them a question about birds? They were there to study to be seamen: most of them were from Negros, like Epifanio. The rest were from Marinduque, Zambales, Cagayan de Oro, Davao. Self is extremely, extremely happy this morning. She was able to wheedle a reading date from her local library for Manila Noir, an anthology that Akashic published last year, and for which she has never given a reading. She’s only one of — ehem — 15 Filipino writers in the book, it was edited by Superstar Jessica Hagedorn, she loves the pieces in it to bits. Why has she never read for it in her own neck of the woods? OMG, why? She wrote a brand new story, just for the anthology. Yup, one winter holiday, almost three years ago, La Hagedorn requested a story from self, and after wringing her hands for nearly a month, and subjecting herself to all sorts of angsty emo feelings, self ended the pity party, grit her teeth, addressed the problem (which had been hovering over her head, a veritable Sword of Damocles, making her incapable of performing even the simplest holiday tasks, such as setting up the Christmas tree) and that very same day, she came up with a story. Turned it in. Got quick thumbs up from Hagedorn. Became pride-ful and slothful. Told the world of her inclusion in said anthology. Crowed about her triumph in her little corner of the world, and then waited for — NOTHING. Everyone in the Philippines and Asia and even the continental U.S. of A. read the anthology, but her story was sandwiched between such greats that no one seemed to have time to comment on it. Nevertheless, nevertheless . . .
She did manage to get Lysley Tenorio (a fellow alum from Stanford’s Creative Writing Program, he teaches at Saint Mary’s in Moraga) to agree to read with her. Quite a feat, as the guy’s got a big agent, a big publisher, and he agreed to make the trek to REDWOOD CITY. And besides, self isn’t sure whether she still can read, it’s been a while. So it is good if Lysley reads with her, for he is an excellent reader. And not only that, he is affable and very used to signing author copies. Now, since self is so energized, she is thinking of contacting other places, such as Books, Inc. in Town & Country. Hello, they already carry it; she’s seen it there, in their Mystery section. So, what’s the problem, self? What’s taking you so long? Get off your couch and who says you can’t? Get yourself over to Book Passage, while you’re at it. 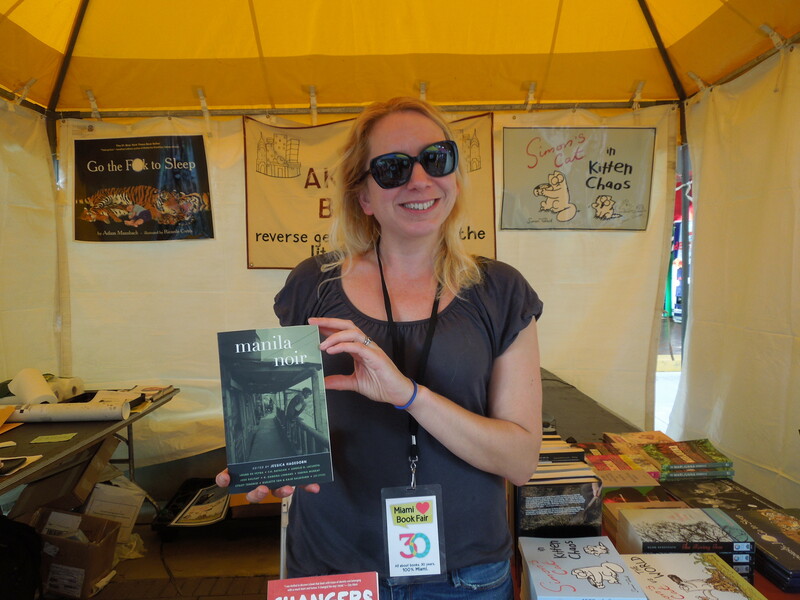 Johanna Ingalls, Managing Editor of Akashic Books, at the 2013 Miami International Book Festival, holding up MANILA NOIR: Self is one of the contributors.